The former king of group buying, Nhom Mua (literally “Group Buy”), went through some recent management and investor struggles but braved the storm and the website is back online. The damage has been done though, and consumers are skeptical of the site. The drama has been the biggest gossip in the technology community in the country. 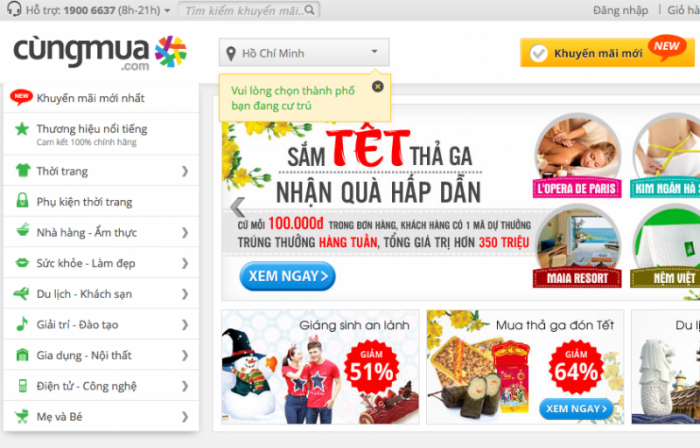 Emerging from the success of Vinabook.com, Vietnam’s leading online bookstore, HotDeal comes from the same team. It sells coupons for everything from men’s socks to Android tablets. Literally named “Buy Together”, Mua Chung serves up all general coupons as well as gives some special attention to tourism products and services. Cung Mua services all major and minor cities in Vietnam for electronics, tourism, fashion, education, and even food. Founded in Hanoi, Vietnam’s capital, Cuc Re (literally “Extremely Cheap”) sells the usual retail products you’d find in a supermarket, plus a range of travel deals. Literally “Invite Each Other”, Ru Nhau is yet another deals service, which includes tourism, food, retail products, fashion, and household supplies. A relatively well organized but run-of-the-mill deal site by the name of Chon Deal, or “Choose A Deal.” They basically have all the same stuff everybody else has.